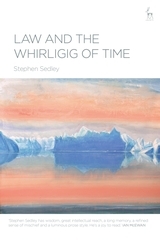 Stephen Sedley, Law and the Whirligig of Time (Hart Publishing, 2018). The first part is concerned with law as part of history – Feste’s ‘whirligig of time’; the second part with law and rights. The third part is a group of biographical and critical pieces on a number of figures from the legal and musical worlds. The final part is more personal, going back to the author’s days at the bar, and then forward to some parting reflections.